AGAIN with the long delays! I'm nearing the end of my interview tour-- just one more to go in Pennsylvania-- then I'm off to read the posts I so sorely miss. Just wanted to get this one out. With prices like these, it would be a shame to not use the books, as that is of course where you get the value of your money. And it is finally decided if the book is ultimately worth it and has paid for itself, or if you might as well have burned your fresh $50. Which is why I'm proud of my project with Duncan-- The Gastronomer's Bookshelf-- because various people are able to share their experiences with cookbooks, and not only do readers get to determine what is gold and what is crap before spending the dough, but also, hopefully in the long term, writers and publishers will churn out better and better product. One of the books I'm currently (mostly) cooking through is the beautifully produced Tartine cookbook, which I got for sale in Manila as it was slightly worn. And really, isn't that the measure of a truly good cookbook? Lisa invited me to bake a bunch of set recipes with her to encourage her to use the cookbook, and I wanted to maximize it as well. (We are not however cooking through it like the guys and gals from Tuesdays with Dorie or Shari's Whisk Wednesdays.) 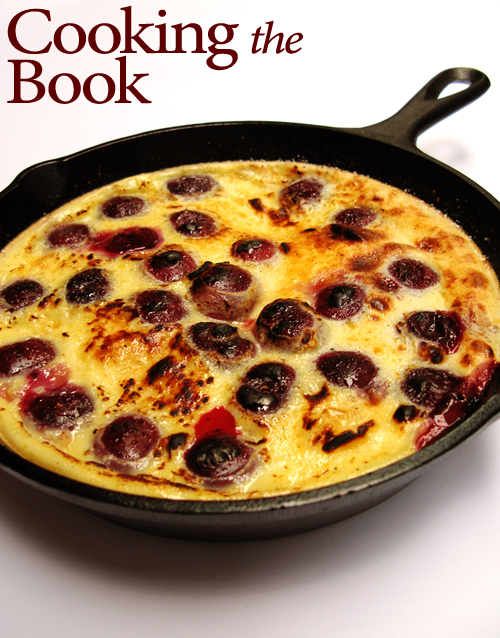 For this month, we started with Clafoutis, as Lisa is Australian and cherries are in season. I got mine imported from Hong Kong/ Australia. The verdict? Very delicious. Must have eaten half of my cast-iron pan's worth. (By the way, Lodge Cabin, excellent product. First time I used it, the eggy goodness came right off.) Even my brother who typically shuns fruit (berries and cherries in particular) enjoyed his share. Though Tartine recommends pitting the cherries, I decided to keep them in for tradition. My only gripe with the recipe was that it didn't brown the way it looked in the book (my pervasive problem with the cookbook in general), and mine took a little longer to bake. 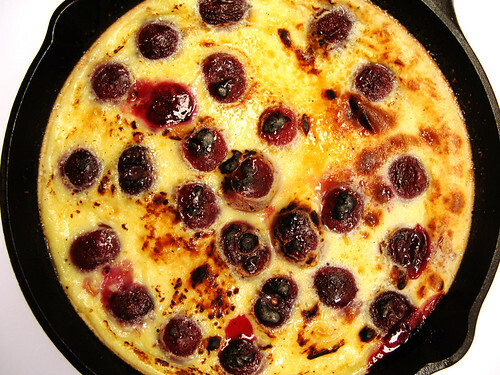 Since I'm a bit pressed for time, I'm just going to link to Lisa's beautiful version of this clafoutis for the recipe from Tartine. See you guys hopefully very soon!